About Periodic Edibles: Periodic focuses solely on producing cannabis caramels made with strain specific canna-butter and canna-coconut oil as their infusion method. These infusions methods ensure all the cannabinoids transfer to the end edible product. All of their Caramels are hand made in an Oregon Department of Agriculture certified commercial kitchen. One of the more affordable edibles with a generous helping of THC, 50mg per piece. This Active sea salt caramel is also made with homemade canna-butter, which generally hits you with a heavier high for longer that distillate. 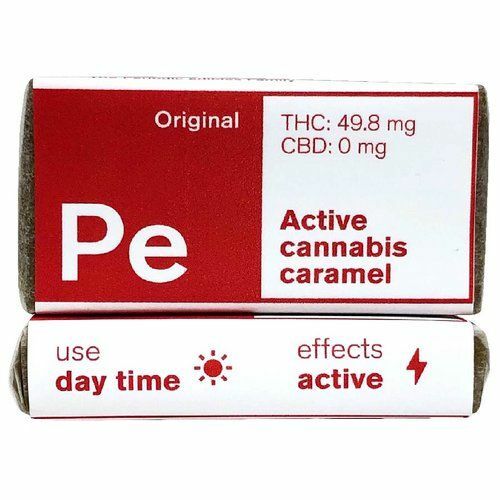 For the caramel-canna enthusiast in you!Now contains terpenes to enhance the specific effects of these caramels. This sativa caramel comes with 3.7mg of Limonene (Lemon/Citrus) and 1.9mg of Pinene (Pine), which is just enough to add in additional sativa effects but keep the classic buttery smooth, salty taste.